Join in and write your own page! It's easy to do. How? Simply click here to return to Weslo. I have an old weslo cadence 855. I used to use it a lot about 5 years ago and haven't used it for several years. Today, I decided I need to get back in shape and started on my old treadmill. But at the end of my session I slowed it down and it just stopped and won't start back up. Do these treadmills have any type of breaker or reset I can try before going out to purchase a new one? This was manufactured in 1997 and still going strong. I no longer remember how much I paid for it, but I would say it was well worth the money. It features pre-programmed options with power incline as well as manual operational use. I have just come to the point now where the walking belt has to be replaced which is at a cost of $100 incl shipping (very reasonable) - otherwise it has been an excellent machine. We purchased it used approx. 2 years ago and the previous owner had used it regularly and increased her cardio & endurance enough to warrant a new high tech treadmill that better suited her needs after having this one for over 8 years. This machine fits my husband and myself great as we average an hour and half worth of exercise almost daily. I have a Weslo LX25 treadmill, that I have had for over 20 yrs. and I love it. It is just now wearing out and I would love to buy another new one, but I can't find one. I have a Weslo LX25 Traedmill that had never been used much. I don't know where you are located. I am located in Wisconsin. If you are interested email me at rllexa@sbcglobal.net. I also have a LifeSpan R2 Recumbant Exercise Bike I would like to sell. I also has never had a lot of use. I do have the manuals for both of these machines. I found an LX25 at a thrift store for $50. It looked like it had been barely used. It worked well for about 400 miles and then the belt started sliding off. I could not figure out how to fix this then the motor burned out. I am heavy and this may be the reason the machine died. Too bad. It was good while it lasted. I have had this treadmill for 8-9+ years with no problems. I got it from my sister who used it for 2-3+ years and she bought it used. It works great! I have had my Weslo Cadence 80 treadmill for about a year now and used it everyday for 30 minutes during winter time. I've been using it from November through April every single day for 30-40 minutes each time. I run outside when the weather is nice. I've never have had any problems with this treadmill. I love the low price, the compact design, and everything else about this machine. I think people on these sites that give Weslo bad reviews are paid to do so by the big expensive brand name treadmills to try to run Weslo out of business. GREED! Not worth the money if your looking for comfort! I used a Weslo recently for about 6 weeks and ended up giving it back to the person who gave it to me. The unit wasn't comfortable to walk on. I felt there wasn't any cushion under the belt. It was extremely loud which made me have to either turn the music up on the ipod or the tv. The belt smelled like burning rubber too after walking about 15mins. This unit was about 1yr old and supposedly hardly used and now I can understand why. I have researched enough to know that cheap probably isn't the way to go if you want a quiet, smooth, and relaxing walking experience in the comforts of your own home. I just bought a used treadmill, At first I was on it for 15 minutes only due to bad knees and now it will only stay on for 7 minutes then shuts off. What can I do to fix this problem, I have only had it for two weeks and I only weight 138 pounds so Im not too heavy. Is it over heating maybe? What is the newer model of this treadmill worth and what is the model number? Mine last for 2 yrs, that is. at $299 clearance price. Re: Treadmill Stopping After 8 Mins. Your treadmill's belt needs lubrication, most likely. Buy a treadmill lubricant spray and read the Weslo instructions to lubricate the treadmill. Also verify that the belt is not too tight. The best treadmill I owned, out of three, was a Weslo I picked up for $50 that was practically thrown out by the original owner because of multiple problems. I brought it home, got the operator's manual from the Internet, then "tuned" and lubricated it. Like most things, they need to be treated with care. I bought my treadmill 4 years ago and have been using it consistently. I have been very satisfied using it.The only setback I'm experiencing is finding instructions on how or not to use lubricant on the belt. I enjoy this treadmill because it was inexpensive and I like it's simple features. I bought my treadmill 4 years ago and have been using it consistently.I know it was one of the cheaper treadmills on the market but at the time it was what I could only afford and have been very satisfied using it.The only setback I'm experiencing is the deteriation of the belt and I'm hoping I can find one to buy as the motor to the treadmill is still going strong. I have a Weslo 860 and it works fine , up until this week. The machine now slows down and stops after just a minute or so of work. If you shut the treadmill off and restart it it comes back to life but quickly has the same problem again. Anyone have any suggestions on what the problem may be? I purchased a Weslo Cadence 840 treadmill in 1992 and simply love it. I've used it pretty much on a daily basis, many times as much as 3 times in a day and it has performed beautifully. I am not a runner, but do a little bit of interval walking/jogging on it. Up to now, the only problem I had was the belt wore down and I had to replace it. Now, unfortunately, it seems to be on it's last breath, but after using it for 16 years, I feel that it was a good machine. I am now in the market for another treadmill and am completely confused as to which one to buy as the reviews on the Weslo Cadence don't seem to be very positive. I've had a Weslo Cadence 860 for approximately 5 years and got it used from a friend of my dad's. I have done NOTHING to maintain it but it has moved to 4 different houses and keeps on tickin. I just hope my next (expensive) treadmill will last as long and take as much of a beating. bought a used Weslo. (1997 model Cadence LX25) Had it 4 days, power went out and now... nothing. LOVED it before it stopped working, now, just a huge thing in my living room. No way to have it fixed, there are no sites to find a repair shop for it, even if I could move it. Help?!?!?! I weight about 135lbs so for me, it is just what I needed to keep my blood pressure and my cholesterol down. Last winter I did 30 or more minutes a day every day of the week. Then, I work all summer and now I'm starting again slowly at just 15 minutes a day and by next week I will be back to my normal training habits and that little machine is just what I need. My treadmill sticks when using it. It works fine with nobody on it, but when I use it for walking, sometimes it sticks for a second, and it is dangerous. Is there something I can do or adjust to fix it? Please Help? Gene. I think the problem you are facing now may be due to the wearing off of the mat rollers in the treadmill. It would be a good idea to take it into a servicing and by doing so, you will get to know what actually is the complaint too. I don't know how old your treadmill is, but my Weslo Cadence started doing that, and it was the beginning of the end. My brother said, if I recall correctly, that it had something to do with ball bearings(? ), which apparently are expensive to replace. I'm shopping for a new treadmill now. The one that went bad was 12 years old. I had bought it for only $100 used about 10 years ago, so I got my money's worth out of it. You're right...its VERY dangerous when it sticks. Weslo Cadence 25 Treadmill is a piece of Crap! It broke in 1 week. I have a cadence model in which I still own. My wife uses it daily since we owned it and I have used it for years as well, but not lately. I have changed the belt on it once and just kept it clean. The only problem that we have had with it is that the incline legs stripped (years ago) and does not work, but other than that it has been great. We have used it in Maryland, North Carolina and Singapore, and now back in North Carolina, so it has traveled around the world with us. I have owned a weslo cadence 860 for 10 years, I run almost every day for 60 minutes or less, I have finally worn out the berrings on my machine. I would recommend this product to anyone, for $400 I got 10 wonderful years!! I love my weslo treadmill. We bought this treadmill about 5 years ago. I used it for a while and then it just sat there in the bedroom taunting us on a daily basis. Finally, we relented and tried to turn it on but it just kept on sleeping. We hardly used it more than 30 times. It's incredible. What could be wrong with this thing? It's not a clothes line. Ours lasted 11 months without breaking down then the running board started to break down and i just replaced the 5/8 of an inch running board (Crappy particle board) with 3/4 inch plywood. It didnt take me long to take old running board out but putting new laminate on the 3/4 inch plywood and drilling holes etc etc took a while. All in all it took me 4 hrs or so to fix and i am a handyman. This model would easily be better if they built it with plywood instead of particle board or mdf or whatever the running board is. But i guess they do this to upsell most people. On the plus side it gets you started on the right track heh pun intended. My wife & I have used a Weslo CS200 for seven years, each 20 minutes per day at 3.5 mph. Today it failed with a burning smell. This was a small footprint Weslo. I cannot say if it would have lasted 7 years if we ran. We were satified and are looking for a new Weslo treadmill. Hopefully we will get at least another 7 years. By the way, the CS200 was made in the US! I don't know if the new ones are. Our total investment for the CS200 was $206.13 (tax included) for seven years. I use to have an old Weslo treadmill that did not fold and had handrails the complete length of the running surface. It had a heart monitor that did not work and a manual incline but I wish I still had it. IT was reliable, it was powerful, and had no digital readouts to malfunction. It only required two dials to set the speed of the mill then you can run on it all day. However, my wife wanted something that took up less room so I bought a Proform...worst of the worst...worked for less than one year and replaced the electronics twice until I finally junked it...oh where is that old Weslo?? some have batteries you need to change for that part to work. Hi I read what you wrote about heart rate would not work and incline did you check to see if your battery in front needed to be replaced. For about 3 yrs now mine lol heart rate, distance, and etc did not work on mine. I was just taking pictures of it to put on Kijij to sell and notice in the front that part of the plastic slide up and did I ever fell like a fool when I put two and two together. I removed very old batteries and put new ones in and it all came on. I was very lucky the old batteries did not damage the unit. ;) Hope thats all yours was to get it working again. My parents bought this treadmill about ten years ago. It is perfect. We are pretty basic people, we want a treadmill that moves, lets us move, and the buttons aren't confusing. this does the job. We have never had a single problem with it, and with 5 family members using it 3x a week each, it does take a pounding. It goes from one of us walking briskly, to one jogging, to my brother running. I don't recall the price, but if I could ship it to where I live now, i would do it in a second. I own a weslo cadence c62 treadmill I have had it for 3 years. It has been very reliable to me and my wife use it four times a week and it is still running like new. From my use of this treadmill, I can say it is very good and reliable. It is also quite comfortable. First of all I'd just like to say that the Weslo 860 is a very basic treadmill but it sure will take a beating. Ours has been working for more than 10 years now with only the following problem occuring recently. Recently have had a problem with the digital readouts. The middle and lower readouts no longer displays the numbers correctly (some of the bars missing when it should display a 3, 5, 8 or 9) and after about 10-15 minutes the readouts reset themselves. Aggrivating when you are changing your routine at key intervals or you want to get a total count of miles and calories at end of workout. Have replaced the batteries (and this did not solve the problem - as I did not think it would) and as far as I can tell no wires are being pinched or severed. Do I need to replace the displays? Can I even do that - are they available? Bought the Weslo Cadence 860 at Canadian Tire in Canada 10+ years ago. We paid less then $300CAD back when we purchased it in 1997. My wife and I have both trained for 2 marathons on it, and it keeps on working well. I would say there is in excess of 3000 miles on it. We have never done any maintenance work on it either. I will admit it is a basic treadmill with a 14x45 track, 2hp motor, inaccurate HR monitor, manual incline, digital screen indicating speed and distance. I have run on many different types of treadmills and admit there is no comparison for a good quality treadmill. However, for the price we paid and the usage, it has been more than adequate. Both the manual and display are available on line. I need info on how to get the digital screen working on my Weslo Cadence 860 working. Does anybody have this? Would really appreciate hearing from you. I have a old weslo 860.
i hooked it up and even used the starter. it still does not work what should i do. is there a plug anywhere else . 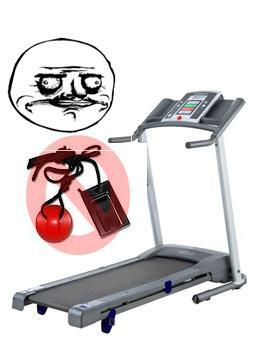 I need the red piece that goes into the treadmill to start it and stop it if there is an accident! Does anyone know where I may find one? Does anyone have or know where I can find the manual for this treadmill. The HR and distance Miles per hour etc... do not work. I wonder if there is a plug in for this as I see a jack under the front pannel? I bought this at a garage sale and it seems to work fine. We bought a Weslo Cadence about 8 years ago - I use it mostly for walking, but occasionally my hubby runs on it. Tonight the running board cracked down the middle (under the belt). Can't really complain about it though we got our moneys worth for 8 years. We've never had trouble with it, and for a non-serious trainer, it was a great machine. For the past 10 years, I have owned a Weslo Cadence 840 treadmill, which I purchased used from a co-worker, who said she paid $400 for it new. I believe she had only owned it a couple of years. I have gotten good service out of it, using it for intermittent running & walking during rainy, cold or extremely hot weather. I'm not a seasoned athlete, or even a seasoned runner, so I wouldn't say I'm one who's tough on treadmills, but I used it a lot since I bought it and, even though my brother tells me the ball bearings(?) or something like that make it irreparable, I feel that my $100 investment went a long way. I am now shopping for another Weslo Cadence because I can get a simple, low-end treadmill to do basic walking and a little sprinting at the price I'm willing to pay. I think that anyone who wants a treadmill for purposes similar to mine, would be quite happy with a Weslo Cadence. Why spend high end when you don't NEED high-end? I have used this treadmill religiously for the last 5 years. On average, it is used 5 times a week, for about 30 to 45 minutes each time. I have seen that it does not have good reviews, however, I think that for the low price that I paid and the great amount of use that it has endured, it is an AWESOME treadmill!! No problems with this treadmill. love this treadmill. no problems here. would definitely recommend. Also feel it has been more than sufficient. For the average person looking for a good cardio workout it fits the bill. I have been very satisfied with this treadmill, with no problems at all. I've had a Weslo Cadence 450 treadmill for about 3 years and have had no problems with it. I'm a male in my 50s and use the treadmill 4 to 5 times a week to walk 30 mins at 4.1-4.5 mph. Because I primarily use it for walking, I like the smaller footprint of a 16" x 45" platform as it doesn't take up much space. The space-saver foldup feature makes it very easy to move around. Lately, however, the belt has been slipping. I've lubed it several times; but the belt needs to be replaced; so, I'm at a decision point as to whether to get a new one or buy a replacement belt (if available). WESLO CADENCE TREADMIL, WON'T GO UNTIL YOU PURCHASE MORE ACCESORIES! What am I supposed to do? spend extra money with the missing parts? This WESLO company should be more careful in their low end products, it would seem like they don't care about customers, how come they miss including vital accessories and also tell you that you must plug this surge suppresor after you have assembled the whole thing, which is not light in weight at all! This machine manufactured in Canada. purchased it for $299:00. still going strong. Just purchased a new weslo waiting for delivery.